Built by King Alfonso XIII for the royals and VIPs attending Seville’s 1929 world fair, the Hotel Alfonso XIII is -literally- built for royalty. 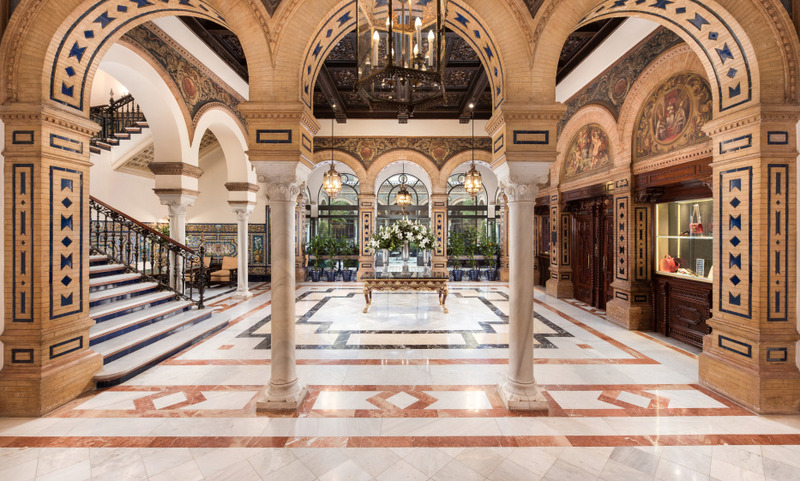 They just don’t make them this way anymore… Built by King Alfonso XIII for the royals and VIPs attending Seville’s 1929 world fair, the Hotel Alfonso XIII is Old World luxury at its best. It’s a prime example of Andalusian design with its mosaic-covered arches, soaring towers and an Instagram-worthy courtyard where orange blossoms surround a bubbling Moorish fountain. Day and night, this is the place to linger over a cava or a cure-all cocktail from Restaurante San Fernando while elsewhere, the Bar Americano is where Sevillians in the know head to for pre-dinner drinks. Setting wise, there’s no doubt that the Hotel Alfonso XIII is something special (it even had a role in the 1962 epic Lawrence of Arabia) but it’s the illustrious history here that makes a stay at this hotel feel like you’re in the centre of not just the city, but the life of it. As the locals put it: Aquí está el todo Sevilla. The whole of Seville is here. The hotel has an unrivaled location in the City Center. Fully renovated and reopened in March 2012. Built by King Alfonso XIII in 1928. Feel the history with its refined Moorish, Andalusian & Castilian rooms. Loved, loved, loved Sevilla and the Alphonso. Hope to return to both one day. We were very pleased with our stay at the Alfonso XIII .Everyone we met was very helpful knowledgeable and friendly. They made my 80th Birthday Celebrations a week to remember. A very nice stay. The location is perfect, the hotel is historical, the staff friendly and professional and the breakfast and San Fernando is exceptional. When we saw it on our first visit to Seville 28 years ago, I hoped that one day we would come back to the city and be able to stay there. It was everything that I had expected, truly beautiful, with staff to match! One of the best hotels I've stayed in. Luxurious, fabulous &amp; with friendly, helpful staff. We will stay again when back in Seville. I thoroughly enjoyed my stay, there is very little I could fault. However, I was slightly disappointed that the main Bar Americano was not open. Wonderful hotel. The staff was polite, the services available were great, and the bed extremely comfortable. Fabulous hotel... Gorgeous, clean and excellent service. Beautiful room with a super comfortable bed. Wonderful location, too'. Enjoyed every minute of our stay! thank you! All four of us need to go back to your Hotel soon. We loved everything about it. The Hotel Alfonso XIII is without a doubt one of the Best in Spain and I hope to be back very soon. A beautiful hotel with a top notch staff. I hope we will return another time. It was a lovely stay for our family. I love the hotel Alphonso XIII. Everything there was just perfect, and being able to take a dip in the swimming pool in the evenings was an exceptional experience. Pure class. A very pleasant hotel with a standard of service which deserves 5 star status. The rooms are spacious but the bathrooms could use a bit of a touch up. Hotel is very well located in the center of Sevilla, everything is close to the hotel and can be walked to. Very nice grand de luxe room, good beds, nice bathroom. Swimming pool area is great for a swim after visiting the city. Good breakfast restaurant in the courtyard, nice inside bar. Nice terrace on the outside for a drink. Overall a great hotel in the center of Sevilla.